Yesterday, Criticwire took a look at how critics reviewed the original “Star Wars,” back when it was possible to treat it as merely a movie and not the locus of a generation-defining phenomenon. That ship has long since sailed, and today’s reviews of “The Force Awakens” — or, as the official screen title has it, “Star Wars: Episode VII — The Force Awakens” — devote much of their space to evaluating what place J.J. Abrams’ revival occupies in the franchise’s overall cosmos. To get right down to brass tacks: Is it better than “The Phantom Menace?” or are fans about to have their hearts broken all over again. The answer to that question is a unanimous “Yes,” although a few critics point out that the price of Abrams’ fan-pleasing approach is an overall feeling of déjà vu. At times, “The Force Awakens” retraces the original films’ path so faithfully that it’s like experiencing double vision. But Daisy Ridley’s Rey emerges as a capable heroine on whose shoulders the new trilogy can comfortably rest, and Adam Driver’s Kylo Ren proves an able figurative (if not necessarily literal) descendant of Darth Vader. By and large, the reviews are extremely sparse with plot details, although as with any movie, viewers who don’t want to know anything at all should steer clear of them. But with a handful or four- and five-star reviews — and one critic going so far as to instantly name it “the best movie of the year, full stop” — fans can at the very least be assured their worst fears won’t be realized, and look forward to tomorrow night’s first public screenings. Couched in “The Force Awakens'” title is the implication that the Force had at some point nodded off – arguably at some point between 1997, and the release of George Lucas’s uneasily re-worked “special editions” of the original trilogy, and 1999, when Jar Jar Binks first reared his unlovely head. From the off, JJ Abrams’s film sets out to shake “Star Wars” from its slumber, and reconnect the series with its much-pined-for past. That it achieves this both immediately and joyously is perhaps the single greatest relief of the movie-going year. In the film’s first shot, the silhouette of a Star Destroyer slices across a pale planet as cleanly and evilly as the cloud does across the moon in the opening sequence of Buñuel’s “Un Chien Andalou,” and it’s a forearm-prickling sight – not only because the image is beautiful, but also because it very deliberately recalls the first, cinema-shaking appearance that same spacecraft made in the prologue of Lucas’s original “Star Wars” film in 1977. For the first 40 minutes or so, “The Force Awakens” feels like something special and fresh. But somewhere along the way, Abrams begins delivering everything we expect, as opposed to those nebulous wonders we didn’t know we wanted. 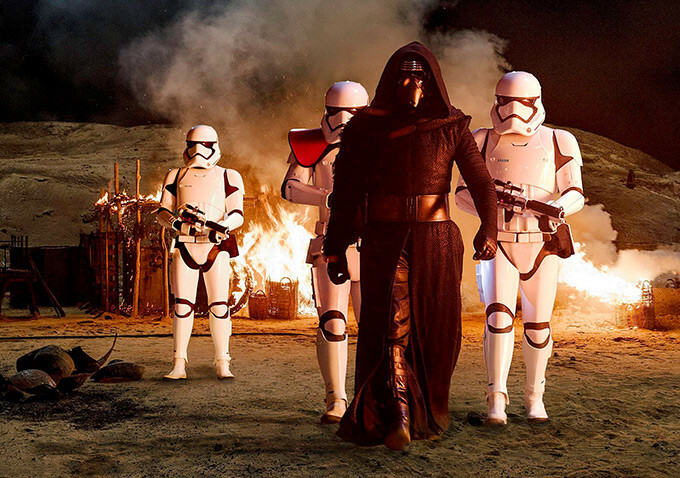 “The Force Awakens” strives to please instead of surprise. Abrams wants us to walk away happy. He just doesn’t give us much to take home. Not only expert homage for the fans but a first-rate, energized piece of mega-Hollywood adventure, the hugely anticipated Star Wars: The Force Awakens stirs more to life than just the Force. The rollicking, space-opera spirit of George Lucas’s original trilogy (you can safely forget the second trio of cynical, tricked-up prequels) emanates from every frame of J.J. Abrams euphoric sequel. It’s also got an infusion of modern-day humor that sometimes steers the movie this close to self-parody — but never sarcastically, nor at the expense of a terrific time. “The Force Awakens” re-awoke my love of the first movie and turned my inner fanboy into my outer fanboy. There are very few films which leave me facially exhausted after grinning for 135 minutes, but this is one. And when Han Solo and Chewie come on, I had a feeling in the cinema I haven’t had since I was 16: not knowing whether to burst into tears or into applause. That giant wheezing sound you hear is a collective sigh of relief, heaved by now-legion generations of “Star Wars” fans, from toddlers to their grandparents, who can rest assured that the Force is still with the franchise they grew up on or grew old with. “The Force Awakens” strikes all the right chords, emotional and narrative, to feel both familiar and exhilaratingly new. Filled with incident, movement and speed, dusted with light layers of tarnished “used future” grime, it captures the kinetic energy that made the first film, from 1977, such a revelation to filmgoers who marveled at Lucas’s mashup of B movies, Saturday-morning serials, Japanese historical epics and mythic heft. As much a restoration as it is a reboot of a cherished movie franchise, it’s the first return trip to that galaxy far, far away since at least 1983 that requires no excuses or apologies. It’s a complete pleasure to behold from start to finish: from the familiar scene-setting scroll — this time pulling us into the story’s central mystery and quest — to the final triumphant notes of John Williams’ classic score. 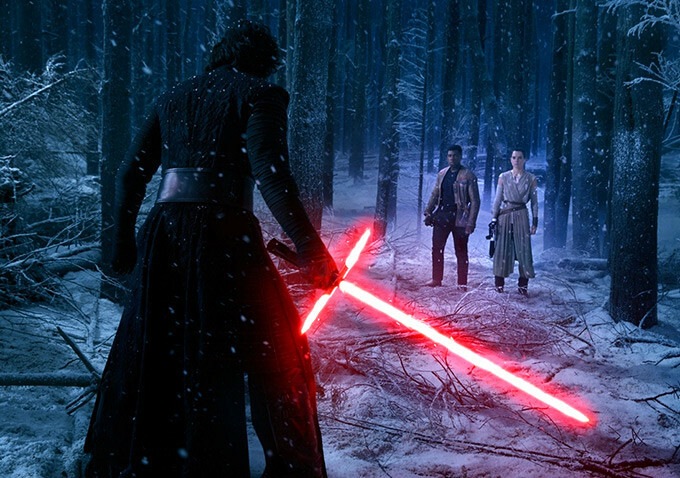 “The Force Awakens” isn’t just one the finest movies of 2015, it’s the best movie of the year, full stop. In the end, “Star Wars: The Force Awakens” feels like the work of a very capable student, one who has studied his subject so diligently and thoroughly that he knows what to do and what to avoid, is smart enough to have engaged one of the experts in the field, in this case Kasdan, to work on the blueprint, and to have ensured that another of the key contributor to the series’ success, John Williams, would return again after all the years. The franchise is indeed reawakened, and we already know when to expect several more installments. Director J.J. Abrams and fellow screenwriters Lawrence Kasdan and Michael Arndt have come up with some potent new characters and outstanding moments. When all goes as partisans hoped it would, you’re glad you’re in the room. 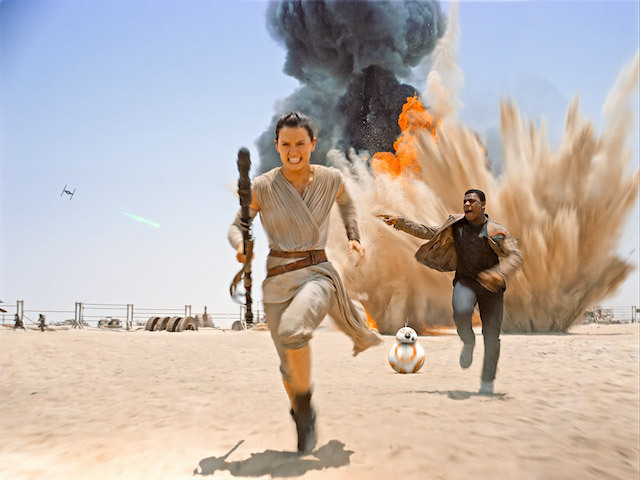 But “The Force Awakens” is also burdened by casting miscalculations and scenes that are flat and ineffective. Sometimes the Force is with this film, sometimes it decidedly is not. In the end, the script often fails the characters, as these strongly-drawn personalities are tossed and turned by chaotic forces in a conflict that doesn’t mean all that much. Most of what we know about the First Order and Resistance are torn from classic “Star Wars” films. Great violence done to one planet has little impact because we don’t know the planet at all. Similarly, there are some huge revelations in the film, but because we’re told about them in passing, in exposition, they don’t mean as much as they could— important character relationships still feel thin and wan, leaving what could be a powerful climax hanging a bit in the wind. Narrative shortcomings aside, perhaps “The Force Awakens'” chief issue is that its so concerned with capturing the tone, feel and magic of the classic “Star Wars” films— which it nails almost immediately—it sometimes forgets to forge its own path. In this sense the movie is both satisfying (no prequel problems here) and undercooked. It’s a movie made by someone who loves “Star Wars” deeply. Someone who can see more clearly than even its creator what made it so special to so many people. Abrams has taken everything that we adore about that first film, delicately mixed up a few elements, and churned out a reverent homage that’s a heck of a lot of fun to watch. From the opening scroll to the sequel-setup ending, he manages to hit each beat of its 38-year-old predecessor. Abrams has essentially passed the torch on to its new cast by making them amalgamations of the originals. You’ll know it when you see it. Who cares if it’s “Star Wars” Mad-Libs? Whether Abrams’ obsessive-compulsive relationship to George Lucas’ 1977 original works for you is a subjective question, of course. You can choose to understand “The Force Awakens” as an embrace of the mythological tradition, in which the same stories recur over and over with minor variations. Or you can see it as the ultimate retreat into formula: “Let’s just make the same damn movie they loved so much the first time!” There are moments when it feels like both of those things, profound and cynical, deeply satisfying and oddly empty. This is the work of a talented mimic or ventriloquist who can just about cover for the fact that he has nothing much to say. He has made an adoring copy of “Star Wars,” seeking to correct its perceived flaws, without understanding that nothing about that movie’s context or meaning or enormous cultural impact can be duplicated. The effect is like pulling a cherished old record album from the shelf and cueing up the needle. 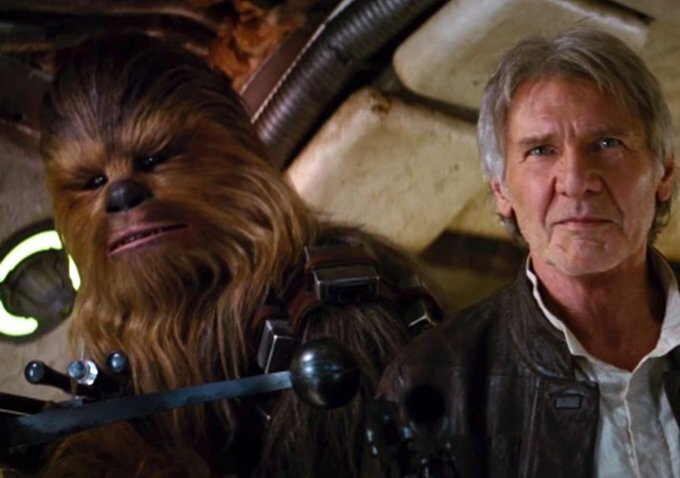 “Star Wars: The Force Awakens” is analog. You can touch it. It feels good. Abrams understands what George Lucas never quite figured out: that we’re less interested in the science fiction future than we are in revisiting the past. We don’t really want to see what happens next in that galaxy far, far away. We want to recapture what it felt like the first time we arrived, in 1977, with a movie called “Star Wars.” We want to go home. “Star Wars: The Force Awakens” takes us there. For all the excellence and good cheer of “The Force Awakens, “its signature achievement is its ability to return us to that real world of those first three “Star Wars “films. Suddenly, as if nothing has happened, as if 30-plus years have happened in a blink, we are “back. “George Lucas’s prequels barely felt as if they had any connection to the original films at all—they were like watching an aging lounge starlet fail to remember the words to her famous songs right after being hit in the head with something blunt and heavy. But “The Force Awakens “is a wondrous magic trick, a piece of pop art that both conjures up long-forgotten memories and attempts to incept new ones. Cynical viewers averse to this kind of super-sized product can fight it all they want, but “The Force Awakens” is certainly the most impressive achievement in Abrams’ career in terms of sheer scale. It excels at a form of slick commercial filmmaking designed to satisfy millions of viewers, which places it lightyears away from Lucas’ own idiosyncratic version of the material. Considering the resources surrounding it, “The Force Awakens” is a multi-billion dollar fan film of the highest order. What Abrams has done is strip “Star Wars” down to its core components, rearranging the stuff people liked about the original trilogy and getting rid of what they hated about the rest. (Don’t hold your breath for a Jar Jar cameo, in other words.) But the prequels, misguided as they often were, dared to be different, to be their own movies. “The Force Awakens” never reaches the heights of escapism Lucas once did, mostly because its pleasures are echoes; by the time our posse walks into a saloon that’s just the cantina in a nicer neighborhood, the déjà vu factor begins to feel as much like a drawback as a benefit. Maybe the cyclical nature of the “Star Wars” universe—the constant teetering between dark and light, the rebalancing of the Force every other decade (or sequel)—excuses the recycled nature of the movie’s fun. Or maybe innovation is overrated when it comes to a mass nostalgic event like the return of the Jedi. But if we’re destined to see more and more episodes, multiplying into an endless horizon like that mandatory opening word crawl, let’s hope they find a few unexplored corners of the galaxy far, far away. Fans might love that, too. “The Force Awakens” isn’t particularly imaginative – it’s missing the more dreamy aspects of Lucas’s better work, and yes, even a bit of the spectacle — but it’s very exciting and involving. Abrams showed in his “Star Trek” films that instead of creating whole new worlds, he’s better at exploring existing ones. And so, there’s a tactile quality to this “Star Wars” that’s very welcome after all these years. We learn a little about what Stormtroopers do after they get back from massacring a village. We find out that Tie-Fighters get locked in for the night. And when two of the characters in “The Force Awakens” come across the old Millennium Falcon, they have to contend with its clunky swivel seats, its outdated display screens, its unwieldy navigation, its thundering cannons. It’s probably the kind of thing every kid raised on “Star Wars” has wondered about at some point – what it must be like to sit in the Millennium Falcon. In moments like these, one senses the joy that Abrams — one of those very kids — must have felt making this thing, and he transfers that same joy to his audience. Sometimes, too, the adherence to “Star Wars” past grates. Parts of the first half hour feel like a remix, from the plans hidden in a small, feisty droid to the rescue of a tortured but still witty prisoner from an evil authoritarian regime. It’s all beautifully crafted, just a little too deferential to what has gone before. But then the new characters take shape and new elements emerge. By the end, this finds fresh ingredients to add to the Star Wars formula, strengthening and deepening it. The prequels this ain’t. We can all breathe again. Ultimately, “The Force Awakens” succeeds in its most crucial mission, which is to establish a sturdy bridge between the previous instalments and future sequels. Aided by top-notch effects, Abrams has devised some nifty action sequences, and he manages to construct the foundation for a grander destiny for some of his newer characters. “The Force Awakens” is a perfectly rousing spectacle, but perhaps more importantly it inspires hope for what could come next. In the world of “Star Wars,” the careful cultivation of the franchise is an undertaking that’s treated even more reverently than the Force. The “Star Wars” movies are fundamentally stories about duty and the many ways the characters’ responsibilities to the galaxy at large conflict with their personal weaknesses, desires and attachments to other people. “The Force Awakens” works in part because it remains interested in those questions and finds fresh ways to pose them. Abrams clearly understands the tone that makes “Star Wars” work, too. Gone are the racist depictions of aliens, the cloying children, the pod races and the worst of the hideously stilted dialogue from Lucas’s prequel films. Instead, Abrams has restored the humor born out of stressful and ridiculous situations and the warmth of genuine camaraderie — I can’t think of a franchise that allows heterosexual men to hug each other with such obvious delight as the “Star Wars” movies do. Star Wars nerds may note that these movies are famous for their repeating motifs — Anakin Skywalker loses his right hand in “Attack of the Clones,” then chops his son Luke’s hand off in “The Empire Strikes Back” — and for lifting from primal myths that have been told and retold for thousands of years. They work precisely because they are familiar. But if not for the presence of old (and now older) characters like Han Solo and Leia, it would be very easy to mistake “The Force Awakens” for a loose remake of “Star Wars,” rather than a sequel to it. J.J. Abrams’s The Force Awakens is the “Star Wars” movie we want it to be: a proper space opera that breathes much-needed life into the franchise George Lucas has spent the past two decades defiling. More importantly, it’s the movie “Star Wars” needs: a chapter that shakes off the turgidity of interminable exposition and debate, picks up a goddamn lightsaber and starts swinging. “The Force Awakens” has all of the strengths of the original trilogy and none of the weaknesses of the prequels. It continues the epic tale of the fight for freedom in a galaxy far, far away by telling the stories of a handful of people who get caught up in the fight, just as Luke Skywalker did, and have to choose sides. If you’re wondering how much “Star Wars” there is in “Star Wars: Episode VII — The Force Awakens,” fret not, nerf herders: Disney’s J.J. Abrams-directed edition might just be the most “Star Wars” movie of all time. Whether that’s a good thing or not, however, will be the subject of debate for years to come. From its instantly evocative opening credits crawl, “The Force Awakens” is a relentless space adventure that’s trying desperately to find balance in the force between the nostalgic and the new. It’s perfectly safe and plenty full of the Force to satisfy fans who’ve been waiting for it for a decade — the diehards still nursing the trauma of the prequels in the deepest recesses of their souls. Thankfully, Abrams’ contemporary “Star Wars” is more modern, diverse and female-empowered than the old order. This installment is satisfying and entertaining in a workmanlike way as Abrams pushes all the right buttons without seeming truly inspired. It does what the dreaded prequels refused to do: It gives us what we want. And what we want is more of the same. The story is essentially a loose repeat of the original “Star Wars.” (We refuse to call it “A New Hope” on principle.) 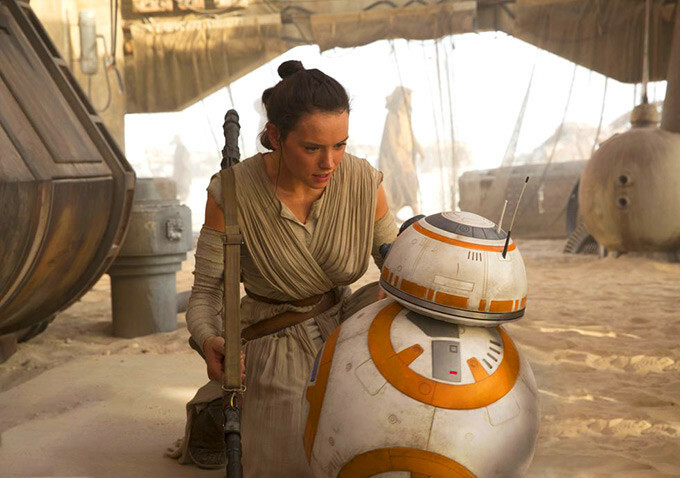 There’s another everyperson/maybe-savior — this time Daisy Ridley’s resilient scavenger Rey — living on a desert planet. She (rather than a he) happens upon another intel-hoarding, bleep-bloopy robot: the mega-super-duper-holy-crap-adorable rollerball BB-8. Nostalgic classics like the Millennium Falcon, beloved characters, another multicultural cantina, that John Williams score, those screen wipes, the Wilhelm Scream — all get dusted off and soldiered out for our delectation. Everything old is basically what it was before, only either aged or with different faces. With the reverence and enthusiasm of a boy playing with the world’s biggest collection of “Star Wars” toys, Abrams uses “The Force Awakens” to re-enact all of his favourite moments, with nothing much of his own to add except more roles for women, and more sympathy for the bad guys. But while it might have been nice to see some elements we weren’t familiar with already, Abrams inspires plenty of reverence and enthusiasm himself: his film, co-written by Lawrence Kasdan (who also co-wrote “The Empire Strikes Back” and “Return of the Jedi”), is truer to the swashbuckling Star Wars spirit than any of Lucas’s prequels. As wonderful as the nostalgia is though, the film’s greatest strength is its ability to create new moments that feel immediately iconic. Our old friends are back, but it’s the new blood carrying the story forward. Their dramatic and emotional beats are gripping, and while more character exploration is needed for some it’s enough that the film leaves us immediately hungry for their further adventures. Rey is a delightfully charismatic spitfire and another strong, capable female character in a year that’s already given us Imperator Furiosa and Ilsa Faust. Finn gives us our first look behind the stormtrooper’s mask and opens the door to a rich world of untapped backstory. Kylo Ren is a newly minted and tragic villain filled with dark promise. By the time the credits roll we’re invested in these and other characters as if they had been along for the Star Wars ride from the beginning, and it’s an unexpected accomplishment in the presence of the ones we’ve actually cherished for decades. Perhaps the nicest surprise is that the script — written by Abrams and Michael Arndt along with Lawrence Kasdan, who worked on both “The Empire Strikes Back” and “Return of the Jedi” — has a better and sharper sense of humor than the original trilogy had. “Star Wars” in its original incarnation, much as I loved it, was not necessarily stacked with great deliverers of wry jokes, and this one is. You know the part in the first “Star Wars” when Han doesn’t know what to say to the guys on the intercom about why they definitely “should not come running,” so he shoots the controls and says, “Boring conversation anyway”? “The Force Awakens” is rich with exactly that kind of tossed-off, surprising, sort of humbly great joke. What’s most important here is the tone. “The Force Awakens” absolutely nails the tone. This feels like the first “Star Wars” movie since 1983. It features the original characters we love. (Good grief, the first time Han Solo and C-3PO see each other in this movie, you will laugh for a week.) It looks “beautiful.” (Of course there’s CGI, but there’s so, so many real, actual things in this movie, you just want to touch them. I’m going out of my way to avoid the much overused term, “practical effects.”) And, again, it’s funny. With humor comes heart, and it’s easy to forgive a few plot points when a movie has this much heart. In this déjà vu sequel, everything is the same, only bigger. To prove it, Abrams layers a hologram of his new astral destroyer next to one of the Death Star, where it dwarfs the original like a bowling ball does a grape. (In another curious word choice, this murderball is powered by “the sun,” not “a sun” or “a star” or, as befits a mapped-out galaxy, “Tejat Prior.”) You sense Abrams both slavishly worshipping “Star Wars “and hoping to show the old girl up, as though the inner powerplays of Lucasfilm are “All About Eve “with overgrown boys and their toys. By the thrilling, achingly good denouement, “The Force Awakens” proves a sturdy, rousing addition to the “Star Wars” canon. (It’s been a long time since we’ve been able to say that, hasn’t it.) Yes, you might find yourself still yearning for the more innocent pleasures of the original films, but that’s likely more about trying to recapture something in our own pasts than it is with the quality of a film that’s just arrived, with a delightful blare, in the here and now. Full of cute droids, wacky aliens (done, mostly, with practical effects), and a game, goofy sense of humor, Abrams’s film exists as a captivating, heady mix of nostalgia and evolution. (Harrison Ford, rakish and dashing as ever, acts as a beautiful bridge between the two.) I can’t wait to see what’s in store for Rey, Finn, BB-8, and the rest. If “The Force Awakens” is any indication, by the end of it all, we ought to have a new “Star Wars” saga quite worthy of its name. “Star Wars” ’77 took its time. Even with the ultimate war between good and evil erupting in the background, Lucas prioritized looking around the room at all the otherworldly stuff, and letting us sit and listen to Luke, Obi-Wan, and Han talk Jedi mumbo jumbo. We knew these guys when the Death Star finally went kablooie. The first half of “The Force Awakens” applies this lesson to powerful effect. Glimpses of the First Order in action, as they execute attacks and fly banners, prep us to accept that they out-Nazi the Empire. The introduction of Rey — a determined gearhead caught in a whimsical, sun-baked malaise — offers a bright alternative. And when she bumps into Finn, it’s an explosion of chemistry. All the slapstick Lucas tried and failed to work into his bustling entries comes to life here, thanks to the magnetic performances of Ridley and Boyega. Endearingly, they essentially comprise the two sides of Lucas’ beloved Indiana Jones: one’s punchy and the other keeps falling over.